From salty chips to sugary ice cream cones, the taste of junk food can be oh-so-tempting. Luckily, we’ve come up with 15 healthy junk food alternatives that will hit the spot and keep you eating healthy and feeling good! Summer is around the corner and we all know that means – shorts, tank tops, pool parties, and beach days. Whether you’re looking for “bikini body” weight loss tips or simply trying to stay healthy in the midst of summer activities, our healthy junk food recipes can help you out. Check out 15 alternative snacks for weight loss below! Potato chips and french fries are classic go-to junk foods that are quick and easy to grab. And they are delicious – there’s no getting around that fact. However, chips and fries are very high in fat and starchy carbs, two things that need to be kept in check for a healthy diet. Plus, they are usually deep-fried. Instead, try baking low-carb vegetables. When you opt for the oven, it is easy to control the amount of oil and salt you use while sticking to healthier veggies. Replace potato chips with kale chips. Using greens makes your chips have significantly fewer grams of fat and more nutritional value, but still gives you that satisfying crunch. You can even bake your chips in all of your favorite flavors like Classic (oil, salt, and pepper), Sea Salt and Vinegar (self explanatory! ), Cheesy (drizzles of vegan cashew cheese or sprinkles of nutritional yeast), or BBQ (paprika, chili powder, garlic powder, brown sugar, and dry mustard). To replicate the convenience of individual sized bags, portion your healthy chips in little baggies for a crisp and salty treat on the go. Forgo french fries and favor roasted veggie fries. Veggie fries can have the same crispy-yet-soft texture as traditional french fries, but they are so much healthier! Popping veggies in the oven is simple and this way you can get a variety of nutrients from baked carrots, parsnips, and sweet potatoes. We use a high-heat vegetable roasting method for our oven roasted sweet potato fries! No oil, no deep-frying, just crunchy,… Read more. Also, when you make fries at home, you can whip up a savory dip that no restaurant chain can rival. 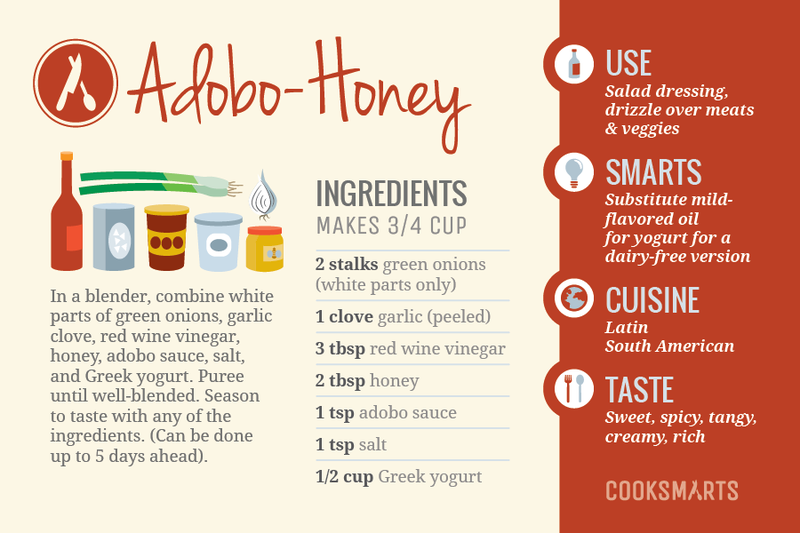 Try our community favorite Adobo-Honey Sauce or make your own “aioli” with simple ingredients! Mix mayo, fresh garlic, Dijon mustard, lemon zest, and lemon juice for a Lemon Aioli. Or add a touch of heat by stirring together mayo, chipotle powder, garlic powder, lime juice, and minced cilantro for a Chipotle Aioli. You can get sweets everywhere, which makes them that much harder to resist. The bad news is that the sugar, fat, and carb count in sweets is no joke and definitely not a friend to anyone trying to lose weight or eat healthy. An easy way to enjoy the sweet without compromising on health is to stick with natural sugars (fruits, honey, maple syrup) and find wheat-free options. Avoid ice cream and embrace fruity frozen yogurt or dark chocolate covered banana pops. Ice cream is not the only way to get your frozen dessert fix. If you’re in a creamy mood, mix diced fruit into your favorite yogurt and stick it in the freezer for a couple hours. If you need a little chocolate in your life, dip bananas in melted 80% dark chocolate (or make your own chocolate!) and pop them in the freezer. The great thing about making your own frozen desserts is that you control the sweetness, and you can make large batches that stay good for months in the freezer. Stay away from donut shops in favor of no-bake energy bites. Power balls are super fast to whip up in the kitchen. They are protein-packed and their soft texture can give you the same feeling of eating donut holes. Pass up cakes and cupcakes and enjoy flourless black bean brownies instead. Now this may sound a little odd, but we dare you to try making some this weekend! You see, the main thing about brownies is the chocolate, and using the right amount of cocoa powder makes you not even notice the beans. Enjoy 4 healthy, delicious smoothie recipes to sweeten up your mornings or give you an energy boost in the afternoons. Get delicious and healthy inspiration: create best-ever smoothies. Instead of eating candy, munch on chocolate-dipped nuts or fruits. The main draw of candy is the texture and combo of flavors. By dipping nuts or fruit in homemade chocolate (or melted dark chocolate if you are short on time! ), you can get the flavors and consistencies you really enjoy while cutting out all of the unnatural ingredients pumped into all commercial candies. If you want a crunch, dip your favorite nuts (you can always dip half-way to reduce calories!) and let them harden in the freezer. If you love chewy candies, use raisins or other dried fruits. If you can’t wait for the freezer to do its magic, simply dip fresh fruit in your warm chocolate and call it a day. Say goodbye to soda and hello to sparkling water with fruit. Whether you drink regular or diet sodas, they both have chemicals and dyes that are not good for the body. To get the refreshing satisfaction of a fizzy beverage, lightly crush and mix fresh fruit into sparkling water or squeeze in fruit juice for a naturally sweet drink. Fast food is often the first thing that comes to mind when you are stressed and want a quick and tasty meal. Unfortunately, picking up food that is fried or carb-heavy is never healthy and won’t help you slim down. When you make homemade versions instead, you can skip the deep-fryer, and use much less oil, sodium, and sugar. The great thing is that there are many quick recipes that will get healthy food on the table in a jiffy. Instead of chowing down on Chinese take-out, cook up your own Chinese food in the kitchen. We have several quick recipes for Chinese-inspired dinners, such as our Baked Sweet & Sour Chicken, General Tso’s Chicken or Hot & Sour Soup. All of these recipes have gluten-free, vegetarian, and Paleo options and take less than 40 minutes to prepare (which is about how long it will take to drive to and from your favorite take-out place). If you want some fried rice to go with your meal, simply use cauliflower rice instead! This healthier version of the take-out favorite that usually features deep-fried chicken lightens things up without sacrificing any flavor. Make pizza without the dough. You can still enjoy all of the saucy and cheesy goodness of pizza without the carbs. Our Pizza-Stuffed Zucchini and Portobello Pizzas are delicious low-carb options that give you way more nutrients than regular pizzas. If you really miss the crust, try out our Radish, Arugula, and Goat Cheese Flatbread. It’s chock full of veggies and is about 400 calories per serving. This low-carb take on pizza means you can eat more veggies while still enjoying all the flavors of a good pizza. Choose to make your burgers leaner and greener. For a heart-healthy burger, you can easily use a lean meat (turkey, chicken, salmon) or a veggie patty and do away with any cheese. To cut the carbs, swap out the buns for lettuce, portobellos, or sweet potato rounds. 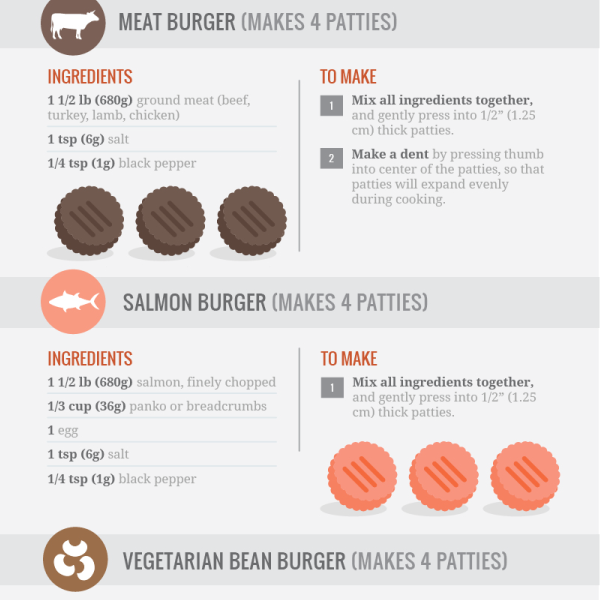 Ultimate Burger Guide: to make a delicious burger. Learn all you need to know to build a delicious burger. 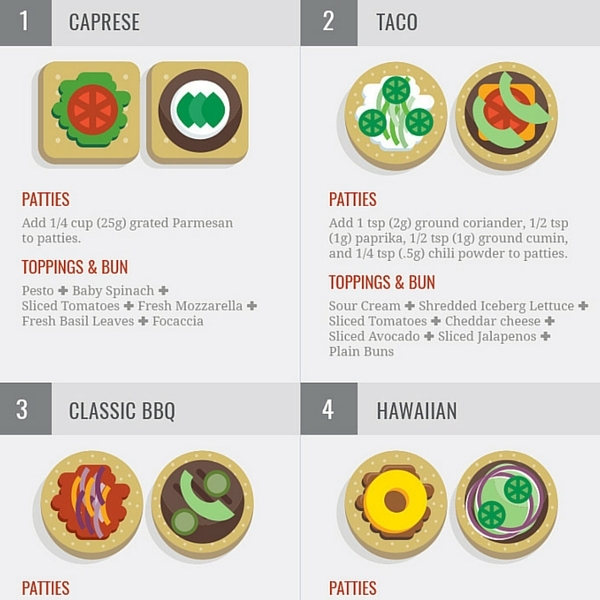 Enjoy a variety of burgers all year long with our favorite burger combos for every taste. Get your fried chicken fix with healthy tenders or falafel. Our oven-baked Panko-Crusted Chicken Tenders are quick, tasty, and still lets you indulge in crispy goodness without the high fat content of fried foods! Baking falafel is also a terrific way to go when you feel the hankering for a delicious fried meal. Also, chicken wings are a staple food for kicking back and watching a game, but they really aren’t friendly to the waistline. Try our Baked Chicken Wings recipe for a healthier way to enjoy the flavors you know and love. Fried chicken wings are a game day favorite and make for a fun meal. Bake them in the oven for a lighter twist and serve in a delicious spicy and savory sauce! Enjoy burritos without the tortilla. With our Chicken Burrito Bowl, you can go flourless and easily adjust the amount of cheese and sour cream you use. Our Paleo version has around 200 fewer calories because it omits dairy and corn. Our vegetarian version also reduces the calories by swapping out the meat for hearty beans. Sometimes you really just want creamy and savory junk food, and it’s hard to find any good ones that are low-fat. Thankfully, there are ways to indulge a little without blowing your diet. Reduce the amount of cheese in your mac & cheese. The days of powdered cheese and fattening sauces can be over! If you replace part of the cheese sauce with pureed butternut squash or sweet potato soup, you will significantly lower the amount of fat in your meal while adding vitamins to your dinner. Try our Stovetop Mac ‘N Cheese recipe, which swaps out half of the cheese sauce for healthy pureed butternut squash soup. Swap out fattening dips for healthy sauces. It is common for dips to accompany chips, crackers, and veggies, and we admit that it’s a great idea. But, instead of having sour cream or cheese-based dips out on the table, opt for tzatziki or even a fresh mango dipping sauce. Now that you have a list of healthy junk food alternatives, you can be on your way to a fit summer without losing the fun. Do you have a favorite low-carb snack or favorite junk food substitute that isn’t on our list? Add it in the comments below! As always, we’re here to help you live your best and healthiest life in the kitchen, so join our cooking community by signing up for our newsletter below. We’ll send you great cooking tips and resources that will help you raise your kitchen IQ and cook with confidence.